Check out the recap and overview of the Neilsen and Pew findings on Mobile over at the Agitator.To apply mobile strategy to social change, I also recommend following the ongoing great work of the team at www.mobileactive.org . Find information to help settle an argument they were having — 27% haveused their phone to get information for that reason in the past 30 days. Is Mobile a part of your strategy? 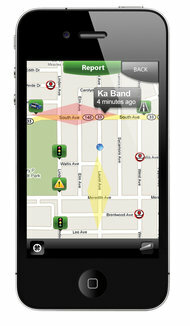 The new feature, Cobra iRadar Community takes the warnings your detector receives and shows them to other iRadar users. Already available for the iPhone, it becomes available for Android phones next month, the company announced at the International Consumer Electronics Show here. this is a beautiful design. I love the idea of gadgets being able to talk to each other so that even though they are distributed to multiple users they act as a comprehensive grid. This would be very interesting in security alarms, smoke detectors, asthma inhalers, door bells, etc. If we can connect like products, in the value added and nonintrusive way, the idea of connecting together data to add further value would provide great advantage. How long will it be before the police seemlessly pass data from radar, and photo enforcement to cars in the street? I am also curious how the radar/phone connection exposes users in states where radar is illegal? Can police ring/txt those phones and remind them of the penalty of using radar detectors? This is a really interesting space. I like the story and ideas around Groundcrew. I look forward to figuring out how jump start the use of Groundcrew with the organizing we thinking about. Netcentric Campaigns "Do Good with the People you know"
The thinking behind the Google Map service is the way every allied organizer should be thinking. Once you are not stuck at the ground level, we need strategists to step back and look at the 30,000 how can we make this happen. The basic concept behind the way they build information on the map is exactly the way distributed advocacy and social change movements MUST be organizing. How do movements build up the capacity to enable collaboration with “almost zero effort” on the part of the organizers and groups? What transactions of everyone else in the movement you work in would be most relevant to your work? What are the traffic jams of social change? The people with cell phone are collaborating. They benefit from the collaboration. They have accepted the bargain of giving back peeks into data about them in order to see the big picture. When you choose to enable Google Maps with My Location, your phone sends anonymous bits of data back to Google describing how fast you're moving. When we combine your speed with the speed of other phones on the road, across thousands of phones moving around a city at any given time, we can get a pretty good picture of live traffic conditions. We continuously combine this data and send it back to you for free in the Google Maps traffic layers. It takes almost zero effort on your part -- just turn on Google Maps for mobile before starting your car -- and the more people that participate, the better the resulting traffic reports get for everybody. Super Crunchers : The Future of Advocacy Evolution? No more experts and intuition. Look at the data trends. Storage to $0 and processing power out the wazoo available for everyone. What massive datasets do you have? What data sets can you create with a little investment. Here are some applets that give you a sense of the kinds of things that Super Crunching can help predict. Use them at your own risk (The lawyer in me feels compelled to emphasize that I make no representation as to their accuracy). .
Work for me? I am picking up entry level staff and interns. If you tune in here often (the 86+ of you), you might find this job really fun and interesting. We have been picking up quite a bit of work in line with training people on the concepts of network-centric advocacy and we are providing partners with direct support, online training and strategy services. I am looking to grow this part of my work at Green Media Toolshed over the next few years. Hopefully, in the next few months I can bring on a few people interested in this work, train them and work with them over the next several years to build the Netcentric Campaigns Division of Green Media Toolshed. I am looking for great staff that want to get into the real work of networking the movement. Please check out the job and pass it on to friends that are interested in a great job in DC. I have a killer project in the works. I am not sure Net2 application and/or presentation does the project justice. The Advocacy Email Index will change the way we scan emails and understand the movements. Who wants to be on our our allies email list? This project will help us scan and navigate thousands of emails more easily. Users will figure out new ways to find allies and swarm issues. I want to know what all the groups at Green Media Toolshed are talking about (clients, or peace movement, yada..yada) Green Media Toolshed has 194 member groups. I wish I knew what issues they are working on today, this week, over the last year. What is important to them? What are they discussion with their members in email? I want to know so I can swarm on issues and support folks. I want help our members network better and self-organize on issues. I need a technorotti or digg for the issues of the movement. My inbox is full and I can't seem to read newsletters fast enough. Our best content is in our enewsletters. I need to be able to process email faster. I might know more about training needs, expertise and partnership opportunities. I need to know the words and trends in my network. 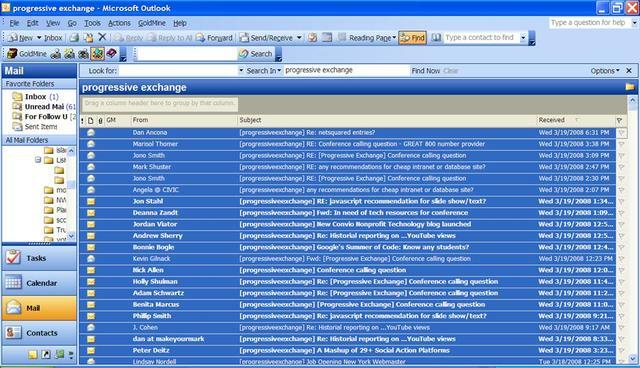 (images of progressive exchange - inbox folder and tag cloud. It is all email subjects since Jan 1. What does it tell you? The Advocacy Email Index will identify key words used in emails to members. We need to know who is talking about what, and where. By illustrating the community “chatter”, this tool will empower messaging, appeals and issue framing. It will help our disconnected and fragmented movement swarm. Vote for it. Pop it on net2 and we will get it finished. We also ran on Center for American Progress emails....over on our blog. Food for thought..How are you organizing your message and audience on cell phones? Hmmm... You think we should be using these in campaigns and advocacy work? Maybe at least running some pilot projects or testing how to move campaign messages in this new medium? Link: Study suggests 100% mobile phone penetration in the US by 2013 - Engadget Mobile. We know, that "100-percent" figure may be a bit tough to wrap your mind around, but let's give it a try, shall we? Current estimates reportedly suggest that "nearly 84-percent of the US population will have mobile phones by the end of 2007," and according to SNL Kagen, that figure should shoot to 100-percent in just six years. Notably, 100-percent penetration does not mean that every single American will own a phone, as it's estimated that some 18 to 20-percent of us will be using multiple mobiles. Additionally, it was noted that data usage / revenue could become increasingly important as newcomers to the wireless world grow fewer, but that tidbit certainly isn't taking anyone by surprise, now is it? Nice. Get your content moving via txt. Send your fish and find out if it is safe to eat. Beautiful app. Fully 85% of American adults use the internet or cell phones – and most use both. 8% of adults exploit the connectivity, the capacity for self expression, and the interactivity of modern information technology. Fully half of adults have a more distant or non-existent relationship to modern information technology. Some of this diffidence is driven by people’s concerns about information overload; some is related to people’s sense that their gadgets have more capacity than users can master; some is connected to people’s sense that things like blogging and creating home-brew videos for YouTube is not for them; and some is rooted in people’s inability to afford or their unwillingness to buy the gear that would bring them into the digital age. 8% of the adult population – contains long-time and frequent online users who don’t like the extra availability that comes with ICTs. 10% of the population – expresses worries about information overload and doesn’t see ICTs helping their personal productivity. 8% of Americans are by any measure deeply involved with Web 2.0 activities, such as blogging, sharing creations online, or remixing digital content. 8% occasionally take advantage of interactivity, but if they had more experience and connectivity, they might do more. They are late adopters of the internet. Few have high-speed connections at home. 15% have some technology, but it does not play a central role in their daily lives. They like how information technology makes them more available to others and helps them learn new things. 11% indifferent despite having either cell phones or online access, these users find connectivity annoying. 15% with neither cell phones nor internet connectivity tend to be older adults. few of them have computers or digital cameras, but they are content with old media. The interesting question does not stop there but goes deeper to look at who are the influencers in all age groups and segments of society. Where are the influentials in new markets on these? Do the old people that are "off the grid" often turn to more "wired" peers or younger crowd for information and services. (my mom would self report in the last categories but she turns to all her kids and students as the final sneakernet bridge to connect her to information culture. Conversely, how much do the most active 8% produce "self-expression" content for others that don't fall in that category? Connection Matters: Spreading a message vs. Spreading a frame. I have been working for a while on the idea that a message moves through a culture not only because it is a good message or perfect frame BUT ALSO because the base is connected. Network-centric advocacy rests to some degree on the idea that connectivity is essential for swarming, mobilizing, fighting message control and dominating public debate. It is essential that message and advocaacy efforts are formated so they can "move" from listserves to cell phones. Here is the example that helps to demonstrate the power of connecctivity. If you think of messages much like fire ..even the perfect message (ie. i tell you you tell the other you know with perfect clarity, they tell others) connectivity matters. Here is a screencast (my first) of a Netlogo demonstration of fire spreading in a forest. I work over the density of the forest and run the program a few times. You can see that there is a point of connectivity (density is that idea that trees are touching or connected) is between 59% and 61%. The connective change is the key to lighting a majority or having a campaign that flames out. Harold Katzmir from FAS research showed me this program. This is a very cool way to leverage the cellphones with video to capture genuine human voice. this is a really cool site. VEEKER and YouthNoise.com challenge you to use the video camera in your mobile phone to show the world where you stand. Veek the Vote began on November 7, and continues! Your voice continues to matter. Show the world where you stand by shooting videos and photos with your mobile phone. VEEKER will automatically distribute them to veekthevote.com, YouthNoise.com, VEEKER.com, and even to your own website (just grab the embed code underneath the player!). The world will see what you send just moments (15 - 60 seconds) later. Note to self... SMS campaign. The goal is to provide informaiton to users and find a new pathway to sign users up in a way that they can be reactivated later. This looks like a cool experiment. Hopefully, development seed blogs the results. Link: Testing SMS Outreach for Women’s Rights | Development Seed Blog. What’s I like about this campaign is that it’s easy. You can either text a message to the SMS short code that’s set up for the campaign, or you can enter your information through their website, just like you would to sign up for an email newsletter. This is great for people who aren’t that familiar with sending text messages. I entered in my cell phone number through their site and received a confirmation text in seconds. But how do you get the website to talk to the platform that’s sending out the text messages? Jeff (one of our Drupal hackers) built a module that allows Planned Parenthood’s Drupal site to talk with the SMS aggregator they’re using, Mobile Accord. When a person enters in their cell phone number and carrier, this information is automatically sent to and collected by Mobile Accord’s system, which then sends out the text messages. He’ll write more about how the module works soon. Here is a little new site that packs the phone interview and the podcast into a nice little service. It creates the opportunity for bottom up talk radio targeting those that have Internet connections or listen to podcast. This will have some applications for the groups that can draw an audience with big names and a good email list. If you check it out please let me know. .. I listened to a few and the basic technology seems to work. It would be cool if enough funny and creative people could create a site of feeds that ran pretty consistently with the same numbers and lots of different programs. The groups could then cross-promte the talk radio to the audiences on their membership list and use it as an alternative channel for an election cycle or campaign. Who knows? A netcentric podcast may be in my future....it would definitely need to be a call in show. 1. Large numbers of people can be mobilized within hours—even minutes—to donate, volunteer, protest, call Congress, boycott—all at little or no cost. 2. Individuals are by-passing the work of established parties and organizations with their self-generated campaigns. 3. Individuals, groups and organizations are generating their own news without the benefit of mainstream media. Traditional ways of doing business are coming to an end. For those concerned with building an active citizenry, these changes need to be understood and harnessed. The December 2004 tsunami that hit the communities encircling the Indian Ocean may well be remembered not only for the size of the tragedy, but for the way the entire continuum of Internet and other communications tools were used in response: blogs coordinated help and communicated news; online contributions were raised in unprecedented amounts; cell phones and text messaging allowed citizen journalists to provide moment-by-moment reporting. Three parallel tracks of Internet usage—nonprofit, commercial and individual—inform the future direction of civic engagement. To date, nonprofit use has focused primarily on supporting or improving existing organizational practices (online brochures, email action alerts, “donate now” links), with a small number of organizations beginning to change how they think about and implement the Internet to engage their constituents. In the commercial sector, Internet use has evolved from supporting traditional business practices to the creation of entirely new business models (just-in-time inventory, engaging the customer as product/service designer). Individuals are increasingly connected, doing so at high speeds, and deriving satisfaction and a sense of community from their time online, reading their news online, joining online support groups, communicating with policymakers. The convergence of these separate tracks was particularly evident during the 2003-2004 U.S. presidential campaign season, during which time we saw significant changes both in how organizations engage citizens and how citizens themselves engage in public policy. Online organizing can reach more people with greater frequency and gives people the opportunity to shape their engagement in real and meaningful ways. While the tools for online engagement may be changing at lightning speed, the outcomes of online engagement do not differ significantly from those of more traditional efforts: individuals donate money and time to worthy causes, people register to vote and show up at the polls, policymakers listen and legislation is passed. Online engagement does not preclude, exclude or even dilute the need for “on land” (or offline) engagement. The key to understanding online civic engagement is not to focus on the latest tool or the latest tactic, but to recognize that engaging people and organizations in this new environment requires new ways of thinking and new organizational models. While civic engagement campaigns have traditionally been designed, initiated and carried out by organizations, today, loose networks of individuals can accomplish campaign objectives and deliver intense bursts of power either in partnership with or completely independent of organizations. The traditional model of “broadcast” communications for civic engagement is being replaced—or at least augmented—by narrowcasting and citizen-as-newsmaker, which can that both broaden and deepen a campaign’s reach. The Internet allows for a level of field operation management never possible before, with online tools to coordinate phone banking and neighborhood canvassing, to mobilize local citizens, to assess campaign impact. The traditional “rule of thirds” that has dominated campaign fundraising has been flipped on its head due to the increasing willingness of individuals to make online transactions plus the significantly lower transaction costs of online giving. 1. Design a connectivity culture that integrates technology and Internet communications with the sociology of engaging human beings. 2. Be nimble and quick to respond to current news and events, tying organizational issues to the often fleeting passion of the public. 3. Push power to the edges, actively encouraging and supporting citizens to help design and carry out their own organizing, and taking what they learn and improving the campaign with their suggestions. 4. Build network-centric leadership that establishes and supports “connectors,” invests in social capital, and develops new mechanisms for feedback and evaluation. We are at a turning point in how Americans participate in civic discourse, where the barriers to full participation are lowered and the potential for powerful participation increased. While the last many years have focused on training individuals and building organizational capacity in specific areas, now is the time to “wire” these investments together while supporting new training, leadership and planning skills. The future of civic engagement belongs to communities and organizations that effectively align online and offline policy, strategy and campaign efforts with the passion and power of individuals. Power to the Edges: Trends in Online Civic Engagement, commissioned by PACE-Philanthropy for Active Citizen Engagement (www.pacefunders.org) and published by PACE and The E-Volve Foundation, provides an overview of the state of online civic engagement—what it is, where it is headed, and what it means for engagement efforts and those who support them. The preparation of this report included a review of relevant literature, monitoring of current online discussions on related topics, and in-depth interviews with leaders in the fields of online technologies, nonprofit capacity building, citizen engagement and social networks. This study is no ultimate guide, but a snapshot in time that serves as a jumping off point for further discussions about how these tools and the culture of online civic engagement can be further developed and scaled for broader, deeper and more lasting citizen action. Readers are invited to read the full report and participate in this ongoing dialogue at www.evolvefoundation.org. Seeking Stories about MobileActive Campaigns! Help. I am wokring on a project with our team at MobileActive to find examples and case studies of activists that make use of mobile phones in campaigns and organizing. We're trying to track down campaigns using mobile phones for awareness building, voter registration, civic participation, event mobilization, fundraising and more. We are interested in learning about campaigns in any part of the world. As many of you know, we are currently tracking already many campaigns here and on our list. Our goal is to compile an up-to-date set of "strategy memos" that showcase past successes and encourage new campaigns to use mobile phones as part of their civil society efforts. If you are involved in or are aware of any campaigns using mobile phones, please send us a note to info [at] mobileactive [dot] org and we will be in touch with you to learn more. The MobileActive Strategy Memos are supported by the Surdna Foundation. MobileActive thanks Surdna and Vince Stehle for their support of this project. We can always use help to continue the work so also please let us know if you can be helpful. Link via Howard which highlights the new reach of government crackdowns "No SMS during Revolution". Link: Curfew in Kathmandu, phone services snapped .:. NewKerala - India's Top Online Newspaper. Nepal King Gyanendra's government Saturday imposed day curfew in the Kathmandu valley and shut down mobile phone services again to thwart an agitation by the opposition, even as Maoists began fresh attacks in two southwestern districts. I have seen governments shutting down media and public gatherings but this is the first crack down on the MobileActive organizing tool. I have blogged on the ideas of mobileactive reporting before ranging from the use of phones to catch police abuse in Seattle to students capturing teachers abusing students, to using phones to inspire others to join them at a rally. We need to work out the strategies and technologies whereas the connected world becomes a tool of the masses not merely a wired world monitored by the state and centralized authorities. Link: WorldChanging: Another World Is Here: Earth Witness. I've long admired the Witness project, which provides video cameras to human rights activists around the world in order to document violations and abuses. I was particularly happy to see the recent news that Witness plans to open up a web portal to enable users of digital cameras and cameraphones to send in their recordings over the Internet, rather than just as hand-carried videotape. While thinking about that development, however, it occurred to me that a similar model might work well for a "second superpower" army of networked environmentalists: imagine a web portal collecting recordings and evidence of ecological problems (human-caused or otherwise), environmental crimes, and significant sources of greenhouse gas emissions. It would be, in essence, an "Earth Witness" project. I just wanted to take notes on this story. Link: Mobile Politics USA: Stuck in First Gear | Personal Democracy Forum. The nomination of John Roberts to the Supreme Court was the first test of Alpert and PFAW's collaboration. "We got an opt-in rate that was 5 times better then any opt in rate our commercial entertainment campaign ever received," says Alpert. "Simply put, we got an opt-in rate of 27 percent, which is unbelievable." PFAW saw it as a huge success as well. According to PFAW's Online Product Manager Matt Pusateri "nearly 25,000 people signed up and used the tool before and during his nomination." This proves something. Members of PFAW are generally not the teenagers that most people in the business of text messaging services cater to. Alpert never dreamed he would have such a high mobile technology success rate with middle aged users. It proves that people, of any age group, can adopt the psychology behind the mobile medium much faster than anticipated. "Once you get somebody to use text messaging -- that is, once you give them the incentive and motivation to use it for something they find extremely useful or important -- they will keep using it," says Alpert. The proof is in the messaging. The political clients that Politxt has been pulling in have been the fastest growing part of Rights Media's business.